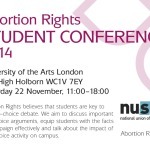 On the 22nd November 2014 Abortion Rights hosted our annual Student Conference. It was well attended with people coming to hear varying fascinating panel discussions and take part in a diverse range of workshops. 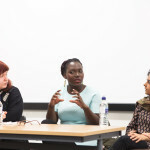 These covered an array of subjects, with topics including: intersectionality and abortion; medical students and abortion; clinic harassment and effective campaign strategies; the media; migrant Students access and experience of abortion service; the trans* perspective; craftivism; and ‘The Politics of Choice’. 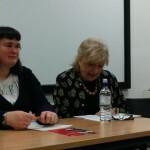 There was a great mix of speakers ranging from activists to abortion providers, journalists to artists, and NUS representatives to student union representatives . The conference brought together students and activists from across the country to network, share ideas and discuss ideas for campaign strategies. We had hoped to create a safe space to discuss and debate the core issues surrounding reproductive justice, and by all accounts it was a success. We would like to thank everyone who attended and took part. Your views and actions are so important to the movement as a whole and we loved hearing from you!